Not long ago, I had requested a good friend of mine named Sam Bros, to draw some Rosenkreuzstilette fanart, because I wanted to see how well she could draw one or more of the girls from Rosenkreuzstilette. 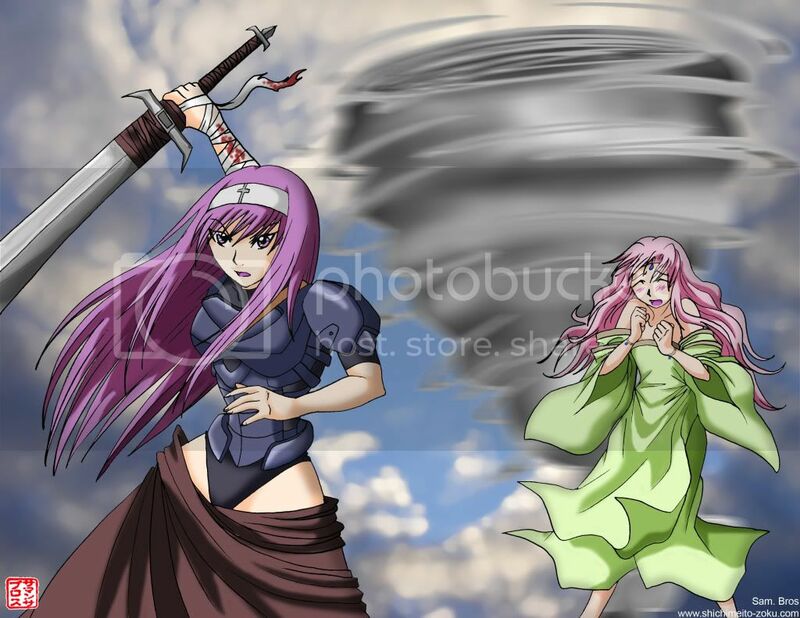 She chose to do Grolla Seyfarth wielding her Grollschwert and Liebea Palesch summoning a storm using Liebesstrum. I did not draw this, I repeat, I did not draw this. I am only showcasing her work. If you want her to hear your opinion, the best thing to do is e-mail her via her site. She will not submit this on an art site like deviantART. I tried to get her to, but she won't. I also should mention the tornado should be somewhat pink in color. Great artwork ! Does she actually plays the game ? That would help for the references. If she doesn't, it's pretty awesome in my opinion.